Clean hands are the key to health! But sometimes you don't have an opportunity to wash hands, at such a moment we need an antibacterial hand gel. 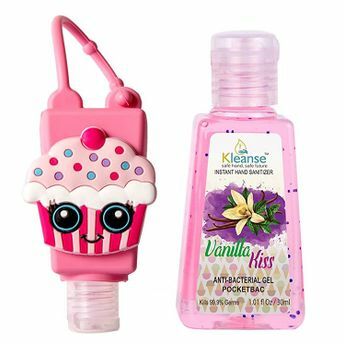 Kleanse Liquid Hand Sanitizer Vanilla Kiss Gel comes with the unique fragrance of vanilla that is lasting but not overpowering. This hand sanitizer has a unique flirty, uplifting scent that you might only find in your perfume, but now you can invest in our vanilla kiss hand sanitizer not only for killing germs, but also for giving your hands a sweet, long lasting smell with a soft touch. Take this wonderful 1.1 oz travel size hand sanitizers bottle holders with you wherever you go for a convenient, easy, and FUN way to help keep the germs away.